One of the great things about my internship at cookNscribble was meeting all sorts of interesting and fascinating people. People who want to talk about food. About growing food. Raising animals. Cooking food. And mostly, people who want to talk about the cool things that they do. To make blueberry pie, I got to work with two such people: Tim Lippert and Molly O’Neill. The reason I got to meet Tim, who is a free-range hog and cattle farmer, was because we were after blueberries. He has several rows of young blueberry bushes on part of his farm. Like the raspberries (and cherries – this has been a fruit picking summer), we were allowed to pick our own. The blueberries were turning all shades of blue and purple on the bushes and so, one afternoon, we went over to talk to Tim and forage amongst the blueberry bushes for ripe fruit. Not all the berries were ripe, some bushes were a few days behind the others, but we picked enough for a few pies and snacks. The main function of Crosby Farm is actually raising pigs and so, after we were done blueberry picking, I got to meet some of them. We passed a shed full of piglets and a boar-in-training before we reached the main group. Tim rears them in the woodland, where it is cool and shaded and the pigs happily make loads of mud. Then, because I’d been saying how my mom has just bought a smallholding and wants to raise some Dexters, I got to meet Tim’s herd of Dexter cattle. Dexters are dwarf cattle, good for smaller spaces and quite friendly. Who knew a blueberry picking adventure could turn into a full farm sight-seeing tour? 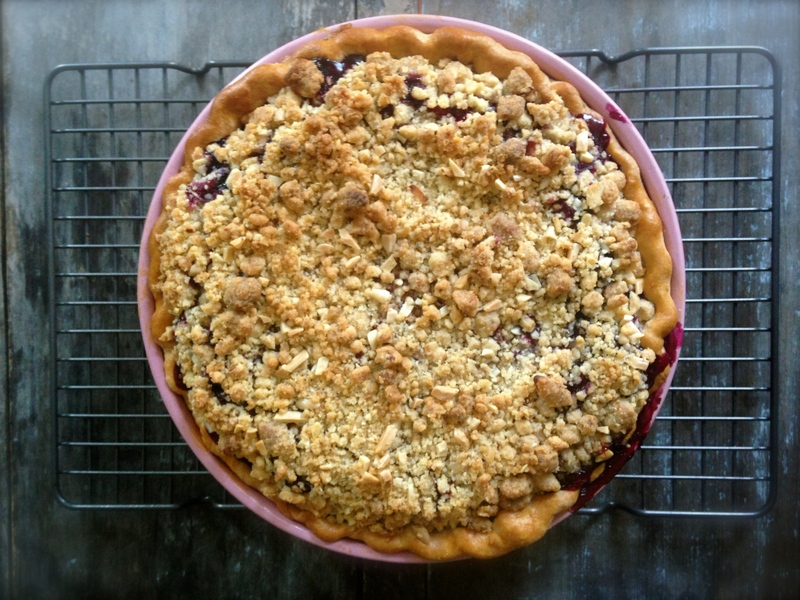 Once we were back in the kitchen, Molly O’Neill shared her secrets of pie-making. For those of you who don’t know, Molly is a doyenne of American food writing. She used to write for the New York Times and has written several books. Now she also teaches food writing, including running the scholars programme I was partly involved in, and organises the LongHouse Food Revival. (You should go if you’re in the area.) Molly has a wealth of food knowledge, just some of which I got to tap into during my internship. One of the things she taught me was about making good pie. Preheat the oven to 180C. Sort out the blueberries first. Put them in a bowl (several cups for a deep-dish pie, around 6) with a cup of sugar, a teaspoon of cinnamon and a cup and a half of flour. Toss everything together with your hands so that you don’t damage the berries too much. Add in a teaspoon of vanilla extract. Let this sit whilst you make the crumble topping. To make the crumble, combine some flaked almonds, marzipan and butter together in a bowl. Work the butter and marzipan into the almonds, like you would rub butter into flour. The mixture will get quite sticky but then you can start to add in plain flour and sugar (which you would have organisedly tossed together already). Lastly, add in some slivered almonds. The mixture should be crumbly (who’d have thought?) and fairly sweet. 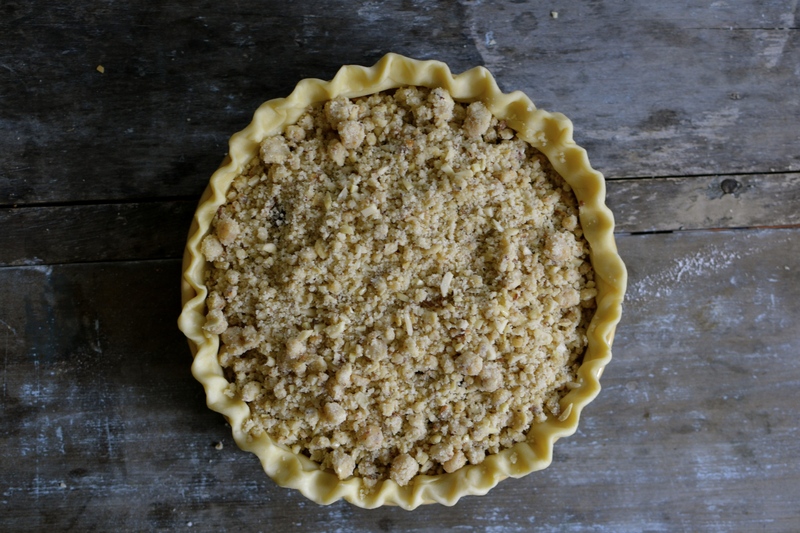 Line a pie dish with pie crust, carefully overhanging the edges by 1cm. Fold these up to create a wave pattern along the edge. 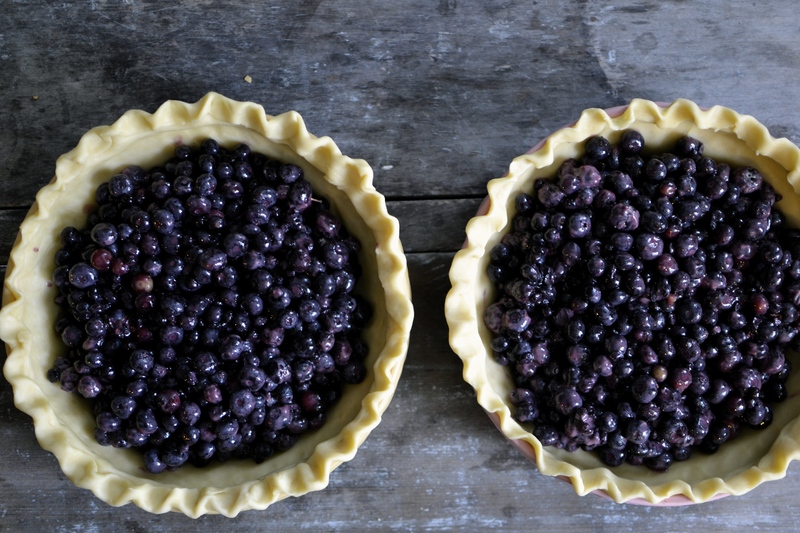 Place the blueberries into the pie dish. Scatter the crumble topping generously on top. Don’t be afraid to use a lot. It tastes amazing.